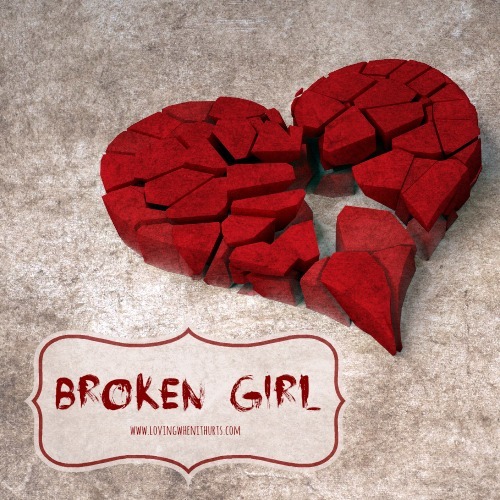 As you have read in previous posts, I was a very broken girl, with a heart that I felt was beyond repair. The fact that my marriage was healing after everything Kris and I had put each other through was itself a miracle, and perhaps it should have been enough for me to turn my eyes towards God and acknowledge His hand at work. Guilt and shame were my shackles. It was hard enough to look at my husband and not fear seeing hurt and anger and betrayal reflected in his eyes. Even when I KNEW that he was not going to look at me that way, I still feared it. That wall I talked about yesterday, between me and God, it kept me from seeing the truth. My vision was cloudy. Between February and April, things began to happen. Little things. I would hear a song and think "Oh how I WISH that could apply to me." Through counseling, we finally began to address my fear of God's punishment. It was not an easy journey. I had to get to the root of what was guiding the fear. One of my first assignments from the counselor was to write a "paper" entitled "Why I Can't Forgive Myself for the Affair." While it wasn't difficult to write from a literally standpoint, my emotions were out of control. I confronted all the guilt and the shame. All the hurt I had caused my husband, this other man, his wife, and his family. It was a look at this hideous person I had become. I defined who I was by the affair and how it left me feeling. When I completed the writing assignment, I didn't feel better. I just had ten pages of typed words solidifying why I was unlovable. I remember telling the counselor that writing all of that didn't teach me anything or help me feel better. It didn't help me accept God's love. It certainly didn't urge me in the direction of forgiving myself! We didn't talk too much about it. I believed the assignment to be inconclusive. Or, perhaps even give the counselor a better view of how messed up I really was. You see, I knew that the things I wrote (things I truly believed) weren't right. I knew that they didn't make sense and that it wasn't something that God was trying to tell me. But I was at a standstill. I couldn't forgive myself for the affair. Maybe that is what the paper was about. Acknowledging that I could not forgive myself. If I couldn't forgive myself, how on earth could I accept Kris or God's forgiveness? The answer was simple. I couldn't. It's amazing to me, looking back now, that I was able to hold it together when I came home. No doubt Kris' love and my renewed love for him held us together. That, and a LOT of prayer. So many people were praying for me. My 9 year old would periodically ask me "Did you find your relationship with God yet?" My friends across the real and Facebook world were praying. People who didn't know me, who were following my other blog, were praying. I think I would be astounded if I knew the actual number of people praying for me during that time. I know my parents were as well. I would have these conversations with myself. I would wonder why I couldn't just let my wall down. Why I couldn't just get it over with and let God forgive me. Surely the pain of that would be easier than what I had endured during the years of the affair, the pain of it coming to the light and trying to put the pieces of my marriage back together. Between February and April, I allowed myself to listen to the local Christian radio station here. For years (literally) I refused to listen to it. I did not want to hear God. Simple truth. I think that because I connect to music so intimately, I knew that God would try to speak to me through it. And I was living the way I wanted to live and I did NOT want to hear it. So I tuned it out. The music. And God. But shortly after I came home, I began listening to JoyFM. And the songs would sometimes leave me weeping. Sometimes I would just sit there wishing that I could be on the receiving end of the proclamations of God's love and grace. My husband believes that God was wooing me during this time. That he was subtly softening my heart. Slowly easing His way back into my heart. Looking back, I can see it. I can see God working and moving. I mean, He had to have been or we would not have been able to find healing and restoration for the very broken marriage we had. And while I could see these little miracles and blessings God was giving to us, I couldn't understand them. But I went from refusing to believe that God was doing anything significant in my heart to hoping with everything in me that He was. I can't remember if I heard this song before Good Friday or after. It doesn't really matter when I heard it. I just know that it speaks to my heart, while I was fighting to keep my walls up, to keep God out. I wanted so desperately to believe that I didn't have to be a broken girl anymore. And maybe, just maybe, I would be able to believe the truth in this song. I am so glad you walked back to God. We all stray sometimes, but God is always watching and waiting to have us back. Thank God for His mercies towards us. Do have a super blessed day! Thank you for your kind words! God has been so faithful! Years later I am reading your blog as a means to heal and understand the personal choices I have made that left my life in an utter mess. I too live through music... I wanted so desperately to hear what this song was, but it seems to have a broken link. I updated the video so you should be able to hear the song. Thanks for letting me know it wasn't working! I love the way God moves through music.